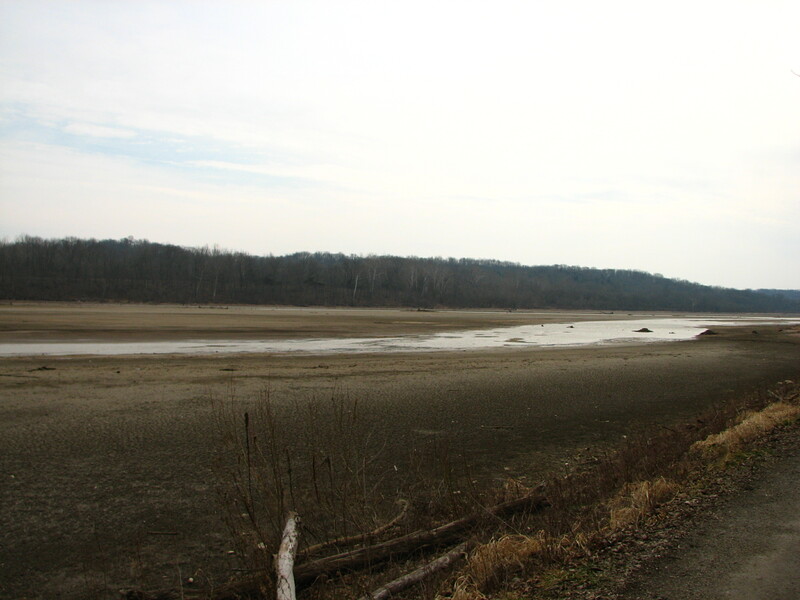 Brookville Lake is a massive lake, sandwiched between Brookville and Liberty Indiana. And at the northern most point near Liberty the lake becomes real shallow and mudflats develops, which in turn attracts countless shore birds, waders, and gulls. 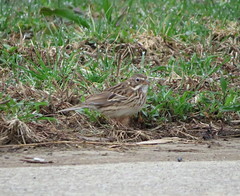 It is a hot spot that most Tri-state birder are familiar with, and probably frequent on a regular basis. And considering the 90 minute drive, I try to make a visit at least a couple of times a year if not more. 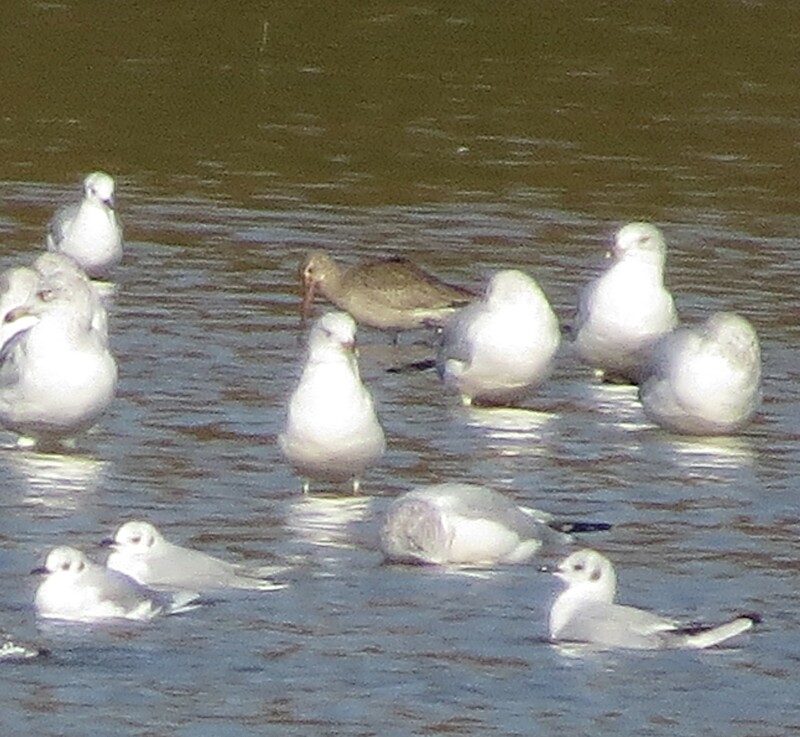 So yesterday after work I made the drive to Brookville Lake to finally put to rest my questionable sighting of a Hudsonian Godwit back in 2012. Doubting oneself about a sighting can become a nagging thought that stays in the back of your mind till you finally make that 100%, no-doubt-about-it, in your face, absolutely positive, sighting. I needed this bird in a bad way. 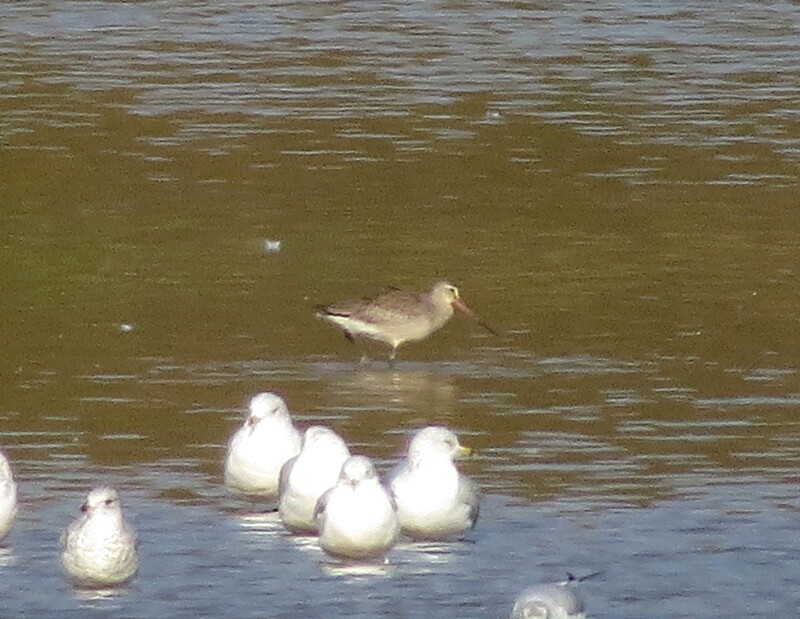 So when this particular bird was originally sighted on Sunday evening, and then stayed around when it was confirmed on Monday, I never thought in a million years the Godwit would stick around. 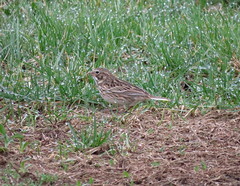 Then it was sighted again on Tuesday. Then Wednesday. Now I’m getting that “twitch”. Wednesday evening I was thinking should I stash my gear in the bird-mobile just in case. Surely this bird won’t hang around for one more day. It always seems that these particular birds are just one day wonders, never to be seen by no more than a few lucky birders. 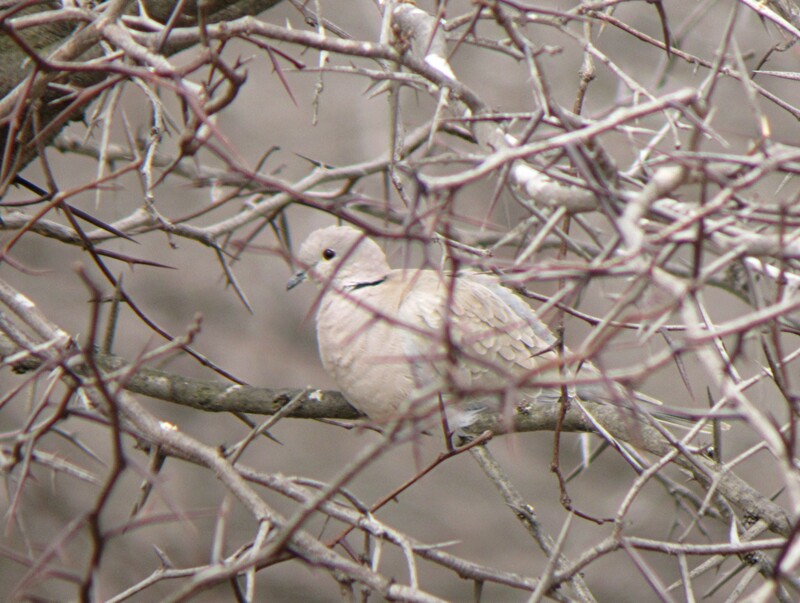 So on Thursday while at work I would frequently check both the Indiana Listserv and the Cincinnati Birders sighting log for anyone to post a sighting on this bird. 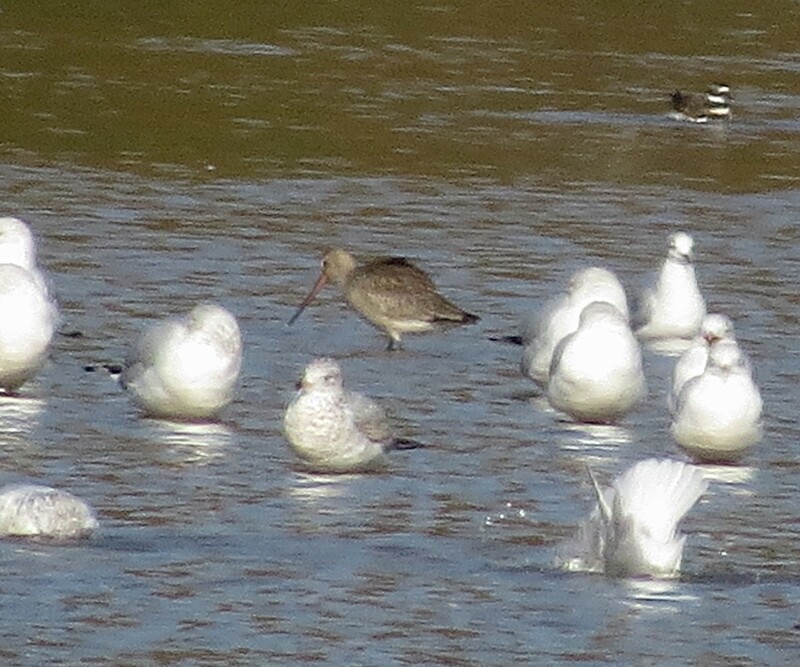 It wasn’t till about 11:30 when the Indian Listserv showed a birder seeing the Godwit that morning. Well that was enough for me. I called my son to bring my gear and meet me by my car at 2:30. The drive was painfully long. Normally I’m a pretty patient driver, however at times like this where anything could happen to send this bird flying south for the winter, slow traffic turns me into a nervous wreak and a raving lunatic all at the same time. It was probably a good thing I was by myself. As I pull up another car is parked with a gentleman getting out of his car and attaching his camera to his monopod. I pull along side an asked if he saw the bird? What bird was I talking about he asked back. 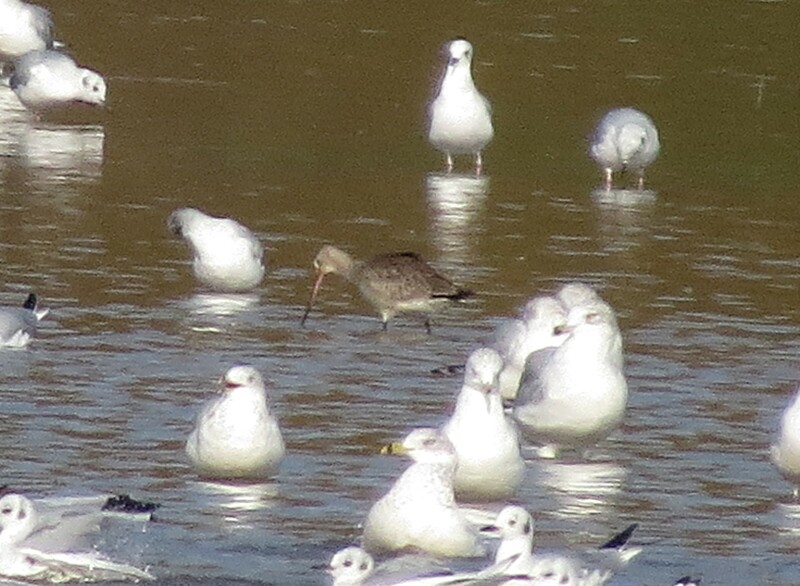 Obviously not aware of the Hudsonian Godwit sighting, I pulled over and grabbed my bins and spotting scope. I walked back to their car an introduced myself to Steve and Jeanne Waddle from Richmond Indiana. They frequently come down to this part of the lake an do a little bird watching and take some photographs. 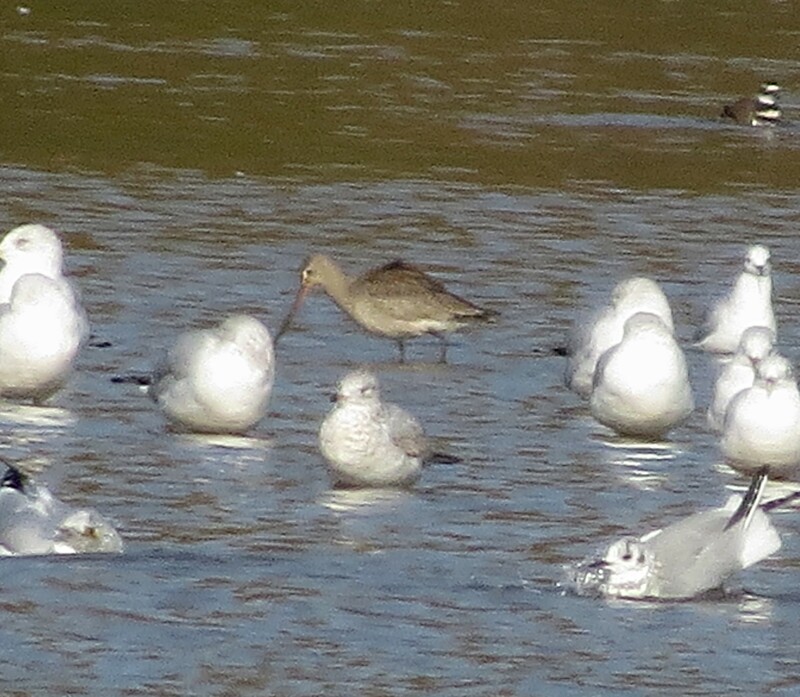 Being relatively new to bird watching they were unaware of the Hudsonian Godwit being here for several days. I quickly set up my scope and started a methodical scan. It’s a large area and this bird could easily be missed among all the other birds and fallen trees that liter the mudflats. I scanned from right to left. Then I repeated from left to right. No bird. I was starting to get that “am I going to dip on the bird again” feeling. Then I saw it. OMG! As you can probably tell by now these are some really terrible pictures. But in my defense I really had the camera maxed out both optically and digitally. It is super grainy and I tried my best to sharpen it up with my computer program. My spotting scope offered a much sharper image and I was really able to notice the important field markings. The black tail for one is right on for Hudsonian. And when a immature Bald eagle flew over the area and all the birds flushed I was able to see the dark underwing lining with the almost black leading edge of the wings. I made sure both Steve and Jeanne had good looks, and for the 90 minutes I was there we got to know each other better. And it turns out Steve is a subscriber to my blog. Small world isn’t it. 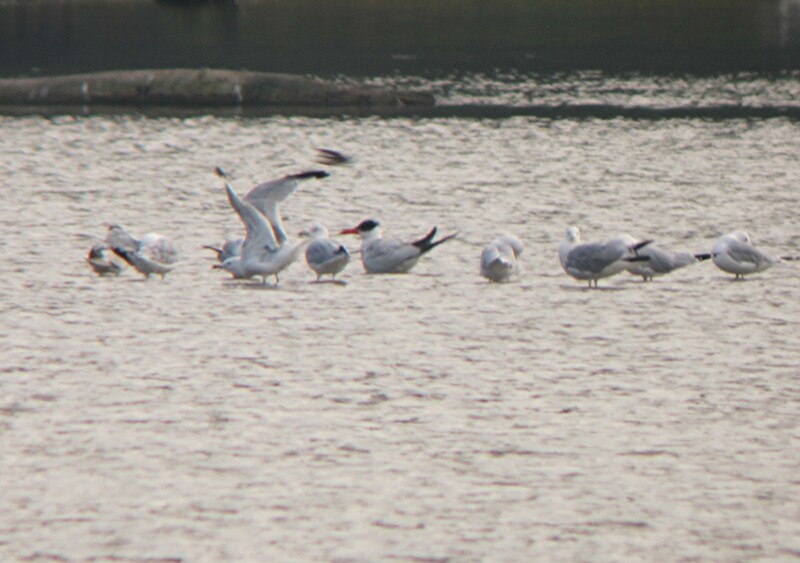 I was on cloud 9 during my long drive home, having finally sighted a proper Hudsonain Godwit, and meeting new friends. All I need now is a Whimbrel and my nemesis bird list will be finished. As we all know Spring can be quite an unusual month in terms of bizarre weather. It was just a few days ago the we had a nice dusting of 6 inches of snow, and yesterday my car thermometer was displaying a 70 degree reading. And it was during this 70 degree Sunday that myself and Jonathan joined up with a rather large group from the Cincinnati Bird Club to circumnavigate Brookville Lake and surrounding countryside. 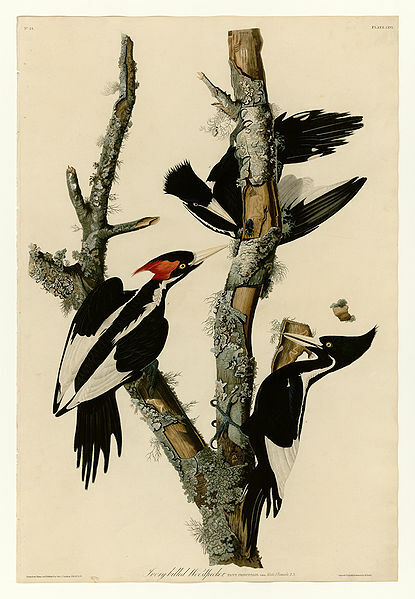 The group was meeting up at a park-n-ride lot on the western part of the city, when caravan together to the lake which was about a 30 minute drive if we headed directly there, however the group leader across hill and dale in search of anything that flies. We started at the southern end of the lake and made our way along the western side stopping here and there, and then cutting across back roads through farm country which is as flat as Kansas, but with more trees. We were searching for Horned Larks and Lapland Longspurs along these roads with wide open fields on either side. 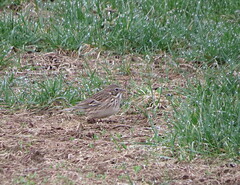 Horned Larks were all that we spotted. Being the winter time they lower the water level which in turn concentrates the ducks into smaller areas. The one nice thing about Brookville lake is that it’s a narrow lake which makes for good viewing if the birds are on the other side of the lake. Also their are access roads all over the place, so getting to the birds can be a little easier than some of the large lakes around where I live. A view from the parking lot towards the public beach. As the morning wore on and the sun warmed up the atmosphere, the Vultures came out in force. Both Black and Turkey Vultures were everywhere. And Bald Eagles, which we counted 7 individuals mostly immature. One of the hotspots on the lake is the famous mudflats on County Line Road at the far northern end of the lake. And it was here that we started to see Sandhill Cranes in the area of the mudflats where they meet the lake. These Sandhill Cranes have been here all winter and still continue flying back and forth between the surrounding fields and the lake. This is the view of the far northern end of the lake. 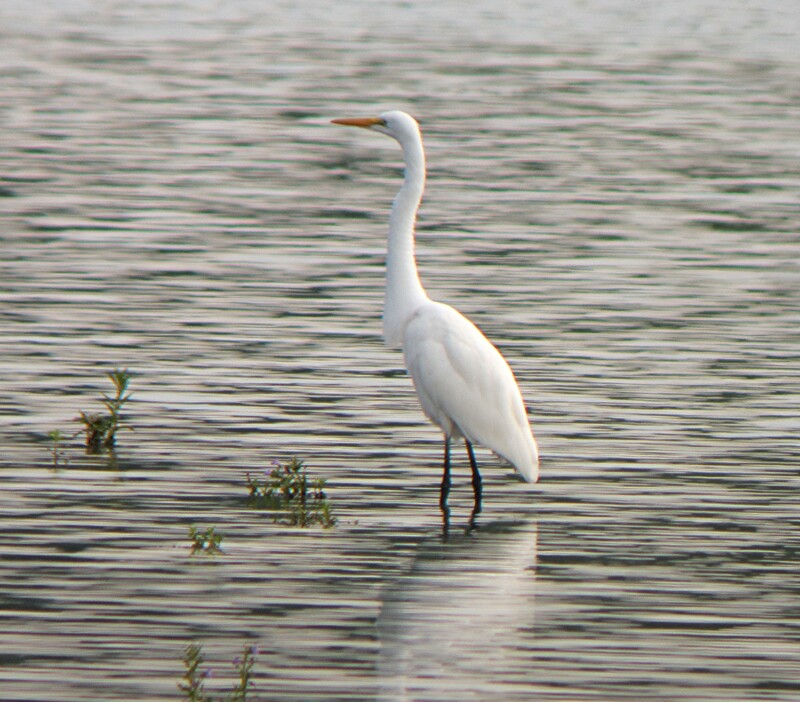 It’s here that we can find some of the best wading birds during Spring migration, just not today. The rest of the morning and a good portion of the afternoon was spent driving to more and more places checking out the lake. Which isn’t a bad thing but when you have a large group, however it does becomes rather tiresome to unload a load back up again time after time after time. One of our stops on this birding adventure was the small town of Liberty Indiana where we were planning on a pit-stop for food and bladder relief. And it just so happens that in every small town in both Ohio and Indiana there will be some grain silos where area farmers bring in the bounty of their fields. 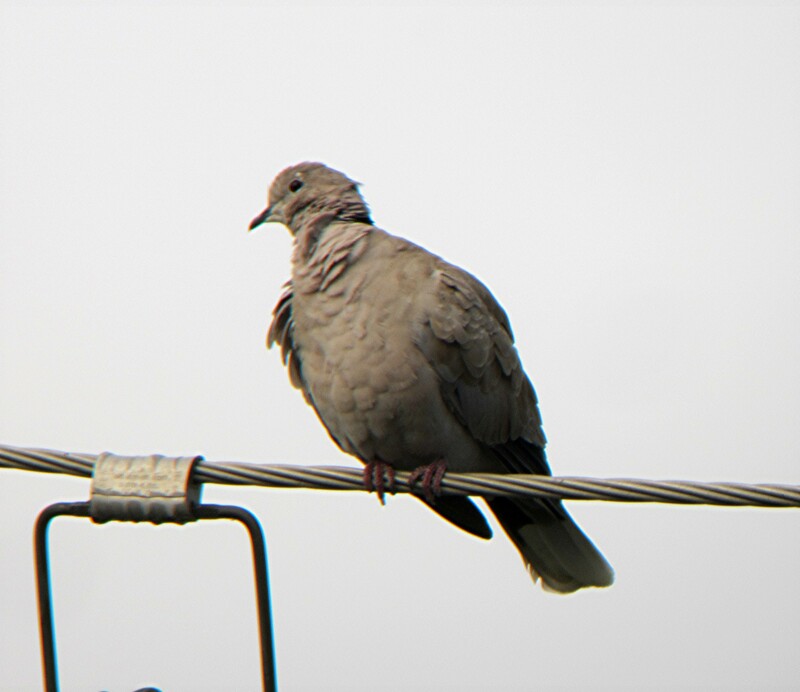 It just so happens that according to Jon that a Eurasian-collared Dove has been seen near and around these particular silos. It took just a couple of minutes till we found a pair. This is one of my better efforts as you can see where the bird gets it’s name. You can see the tell tale black band that runs along the back of the birds neck. After a few more stops around the lake Jon and I decided it was time to pack it in. That 1 less hour of sleep was taking it’s toll and we needed a nap. It was a very good day with some good number of birds. Brookville Lake & Whitewater S.R.A. As with the majority of my recent birding trips this one started out with a simple text message to Jonathan. “Hey Jon want to go birding”. Whereupon he’ll reply, “Sounds good, where do you want to go”. After this exchange of simple sentences begins the process of whittling down the details. With a beautiful day in-store we decided on something a little different for the both of us. We’ve both been to Brookville Lake in the past, however this time we wanted to dive in and try to get to know this area a little better than just driving to Treaty Line Road in the Spring for wading birds. The morning begins with getting up at my normal weekday hour and setting about gathering my gear and getting onto Bing maps and studying the roads in and around the Brookville Lake area. Picking up Jon at 8 am we hit the highway for the long drive. One of the target species today are Sandhill Cranes. My only experience with these beautiful birds is when I see them fly over. In recent years one of the most reliable places to see them in west of Seymour Indiana in a place called Ewing Bottoms. However this is a bit of a long drive and there have been some sightings of them in the Brookville area, so our choice was pretty easy. We approached the lake from the south and our first stop is the dam. Walking out onto the dam we sat up our scopes in hopes of seeing anything. Except for a small group of Pied-billed Grebes and a bunch of busy White-throated Sparrows, the dam area wasn’t how we wanted to start the day. Jumping back into the bird-mobile we were off to follow up on the posting that Allan Claybon posted on the Sandhills, which would lead us to Whitewater S.R.A. If you look at a map of the area you’d see that both parks are adjacent to each other, so to get to the mud flats where Alan had seen the birds we have to first go through Whitewater Park. And if you’ve ever birded with Jon and myself in the past you’ll soon realize that we get distracted quite easily and go off the beaten path and forgo our true destination in search of other species. So as we stopped and birded a certain area, we’d move onto the next. It was at one of these road side stops as we were checking out Evergreens for Crossbills and Siskins we heard Sandhill Cranes calling. Driving to where we heard them call, we pulled off the road and trekked into a field of corn stubble as the Cranes continued to call. After several minutes of trying to get into position we spotted the top of their heads as we counted about 30 cranes. However the view from this spot was awful so studying where we were, we had a good idea that we might be a better view if we left the park and follow this one road to where we might have a view. And boy did we. In a corn field behind this farm house sits this massive flock. You don’t really realize how one can feel when you see such magnificent birds at close range. We stood there for about 30 minutes as I jockeyed for different angles to get more digiscoped pictures. Just seeing them on the ground feeding like this was a true thrill and if you ever want to set the seed of bird watching in anyone, show them a sight like this. Not wanting to spend the entire day at this location we reluctantly preceded with our day. We wanted to cover the lake and see what waterfowl had dropped in. Several boat ramps and public beach access area dot the lake and we drove to as many as we had time for We did find one area where we spotted several hundred ducks and geese, and if it wasn’t for this one spot we might have been skunked on any waterfowl for the day. 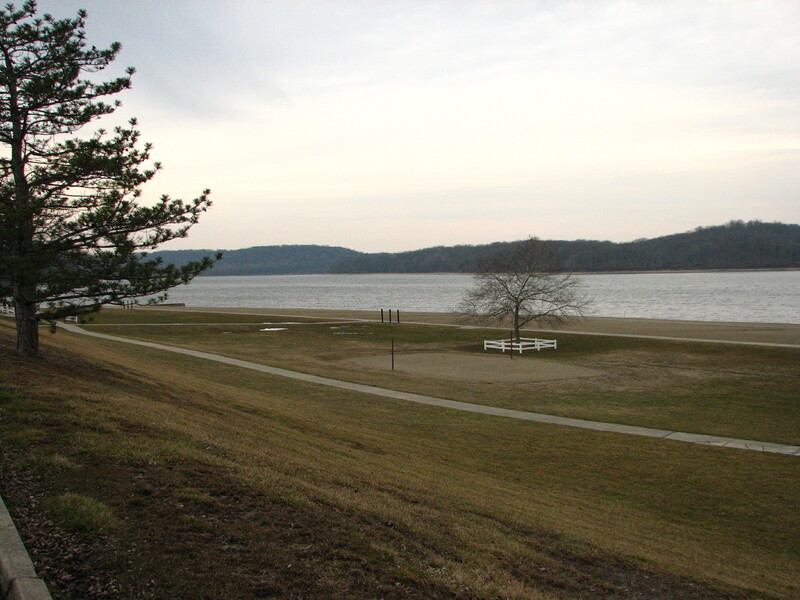 Constructed in 1968, Brookville Lake is 5,260 acres and 17 miles from north to south, so getting from one vantage point to the other takes some time, and with the shortening of daytime light time is precious. And as the day wore on we finally made our way to the northern end of the lake, just north of the Dunlapsville causeway which traverses the lake from east to west. Water levels were so low that this area was turned into a massive mud flats with small pools of standing water. It was quite a sight. A lone Great Blue Heron in the shade. However the most impressive display was all the Bald Eagles. At one point we counted 10 either in the sky or perched at one time. One might forget that you’re in Ohio and not Alaska. 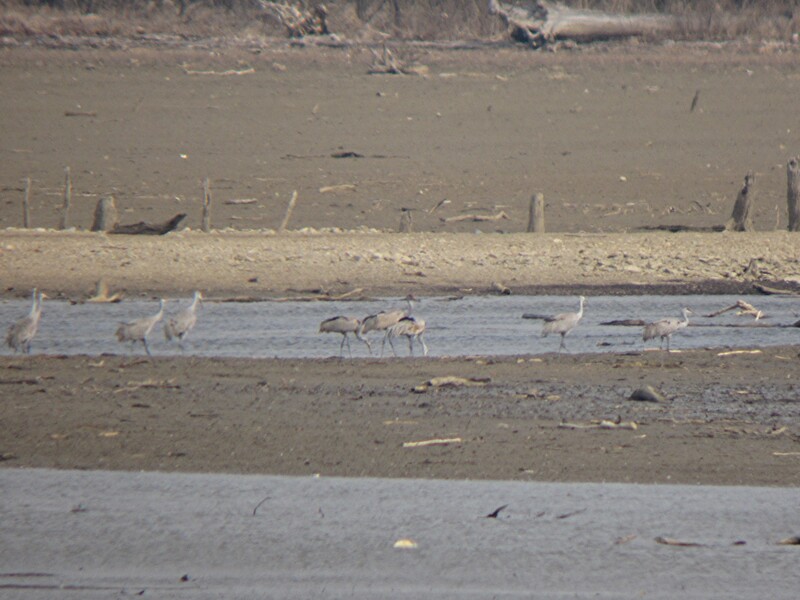 In one of the small pools in the mud flats sat a group of 13 Sandhill Cranes. Viewing them through our scopes it was about this time we heard the “chortle” call of more cranes coming in out of the east. 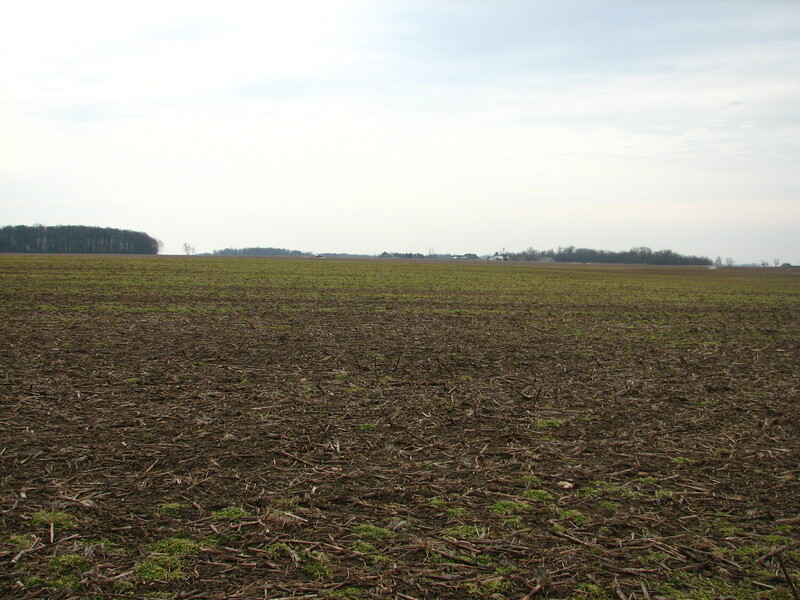 It was the large flock we had seen earlier feeding in the corn field coming to the mud flats. Wave after wave flew overhead as we marveled at the sight of these creatures glide in to join the others. They were everywhere, at least 200 individuals. 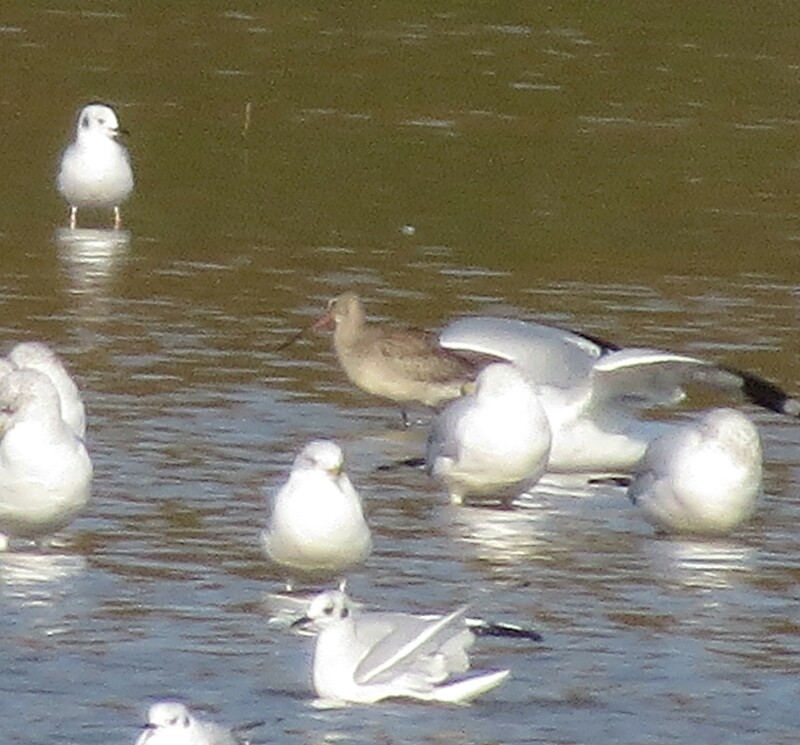 Jon and Samantha Frodge reported 2 Hudsonian Godwits at Treaty Line Road at Brookville Lake. I’m not sure on the time of day, however with this information it will be an early morning for me as I chase this life bird.